Labelled an “Atlantic Dill” pumpkin with a small piece of paper attached with scotch tape (much more desirable that the pentel pen markings on other pumpkins that render them aesthetically challenged from the get go), this 9 kilo pumpkin looked part diseased, part mutant. Instead of the classic bright orange and relatively smooth skin, this had unusual, irregular bumps and veins of green all over its skin. I think the label, “atlantic dill” was not only a misnomer, I think the more correct name of a pumpkin type is Dill’s Atlantic Giant Pumpkin, but I suspect this may not have really have been an Atlantic Giant at all… but with so many closely related pumpkin cousins, all that matters really is what it looks like (assuming you aren’t buying it to cook with). 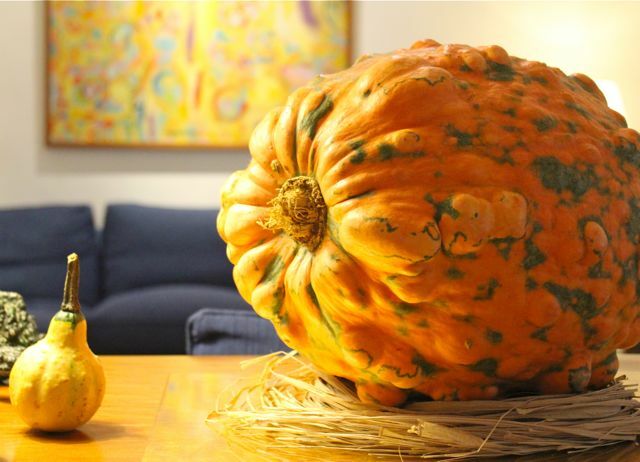 The nine-kilo pumpkin now sits on an altar table in our living room, alongside some other unusually shaped gourds, also from Puentespina. Without blemishes or barring some pest worming its way into the fruit’s flesh, these should easily last the month of October until Hallow’s Eve. The seemingly endless selection of gourds meant I kept adding one more and then another to my basket before I finally paid my bill. 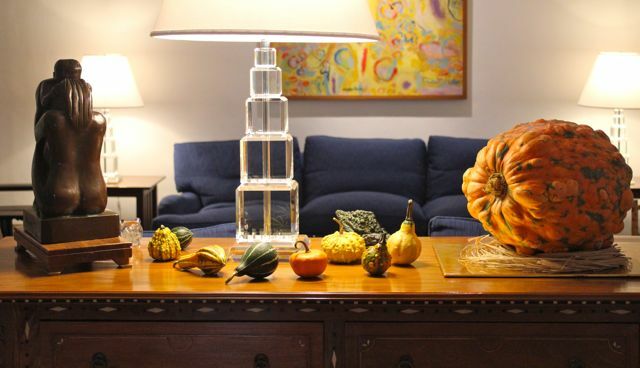 The excuse was that I was buying gourds to put in our restaurants in Cebu, but of course I picked out the most interesting ones for our holiday spread at home. You might be interested to view this gallery of paintings of gourds by Filipina artist Ofelia Gelvezon Tequi: http://gelvezon-tequi.vitenet.com/gallery/2008-perigord.html. Enjoy! There’s something about the colors of fall that makes you feel alive and energetic. Was in the US this time last year, and thoroughly enjoyed the food, foliage and atmosphere. Artisanal beers and coffees that use pumpkin, etc. 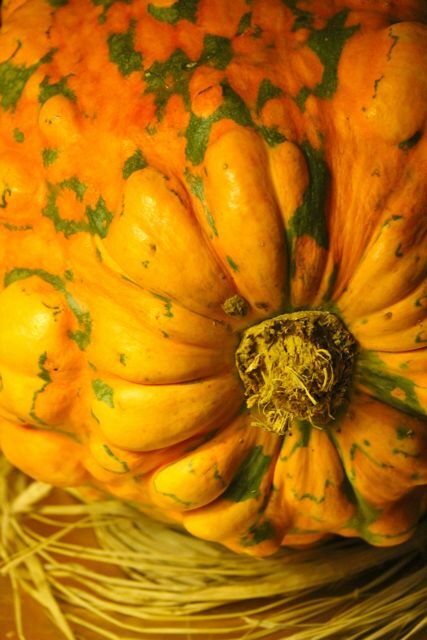 Gramercy Tavern, Eataly, etc all had pumpkin related special offerings. 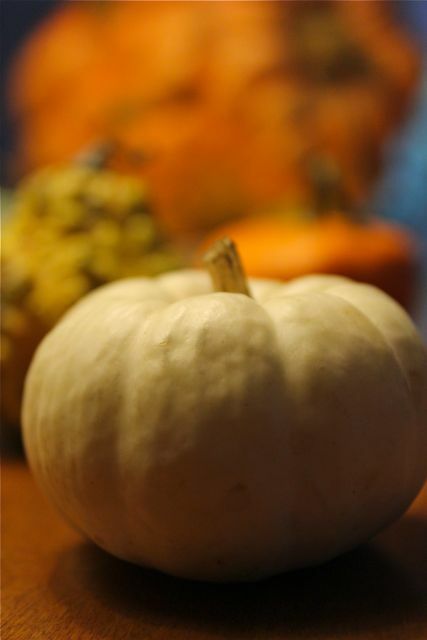 Locally, some restos like Mesa in GB5 have pumpkin festivals featuring dishes involving lots of pumpkins. I rarely turn down a serving of pumpkin soup anywhere. Here’s to the great pumpkin! Andrew Lim: I quite agree with you on the local calabasa variety. The calabasa is flavorful even before it reaches maturity. When shredded with the tender skin makes a nutritious yummy breakfast herbed omelet and can stand on its own without bread or rice ( especially for people who are concerned about their girth) . 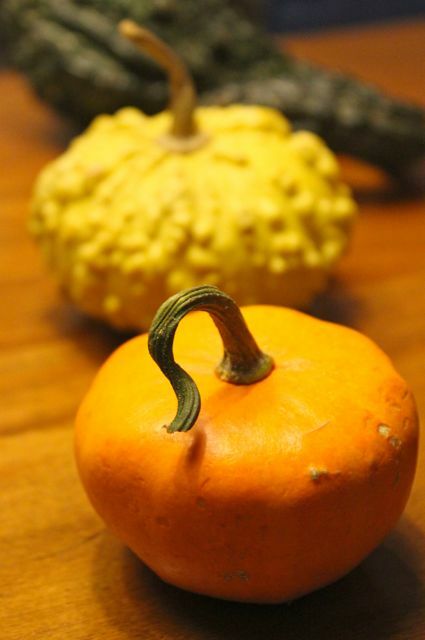 I wonder if the kabocha squash, another favorite is available locally. I plan to bring seeds to cultivate in Puerto Princesa where I can source it when I am on holiday there. I tend not to buy butternut squash in favor of kabocha. I like it baked , sprinkled with crumbled feta and tahini and garnished with cilantro, a nice accompaniment to grilled poultry, lamb or pork. MM, just love your altar table setting with my favorite painting in the background. EJ: Thanks for the link. Beautiful, crisp uncluttered work, vibrant colors but quiet and relaxing to the eye; food for the soul. Tropical pumpkins seem tastier and starchier but the colour isn’t as vibrant especially for soup. So I combine it with either carrots or Australian blue pumpkin to give it a brighter hue. The plebeian in me also loves to add a little bit of the syrup from canned peaches into the soup. Somehow it works……..
thanks for the timely post MM. happy canadian thankgiving day tomorrow to all fil-cans!!! the psychology of physical attraction? those in the photo taste so good even if they look horrible … happy thanksgiving, CANADA!!! Speaking of Halloween, it would be hard to top the scare that you gave your neighbors last year but I’m sure you’ll come up with something. kinda spooky MM and so interesting! local varieties are not as intense (color wise) and oddly shaped as those above. 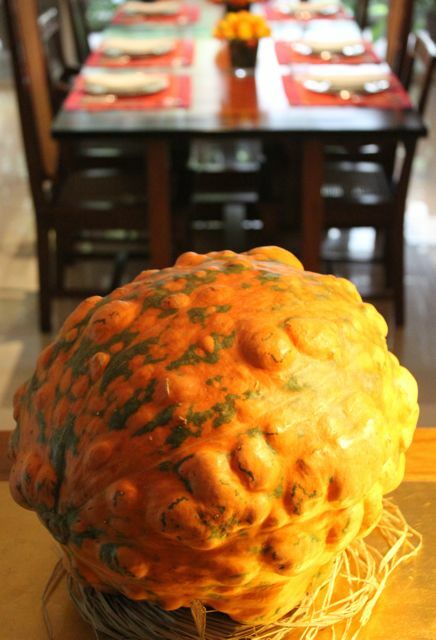 Only a few indeed appreciate the beauty of a squash. Great posting mm!!! 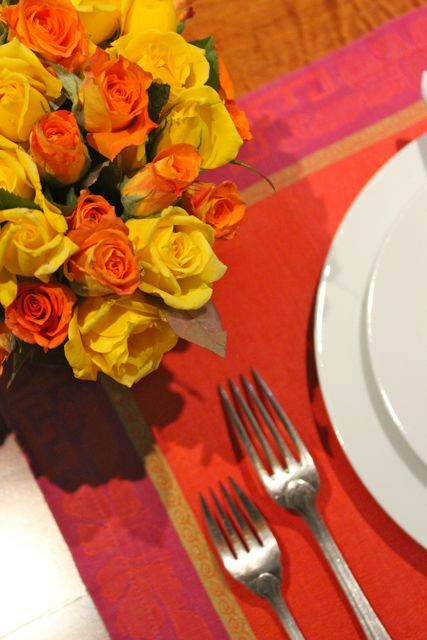 Andrew: I prefer the local kalabasa’s taste but it tends to be too pale to make my favorite pumpkin soup with. I usually roast the squash to a deeper char for more color (and flavor), add some carrots, or I blitz it with some malunggay for a different color. MM, I was also in Manila Seedling last Saturday morning (my first time to go there) and also saw the assorted gourds. It was so nice to look at, I was tempted to buy but there are no kids at my house so I stopped myself. I already spent a lot at another shop for my first vegetable & herb garden, hence, the hesitation. I wish I could have seen you though. Your blog has always been a food, home entertainment, and rant source for me! Regarding the roses in low vases, how long do they last once they’re cut that short? Is there a special solution you put them in? Dogbone, if you “prep” the roses well, they should be fine for 5 days or so. 1. Buy the freshest roses you can find. 2. Prepare a bucket filled with cool water and nothing else. 3. 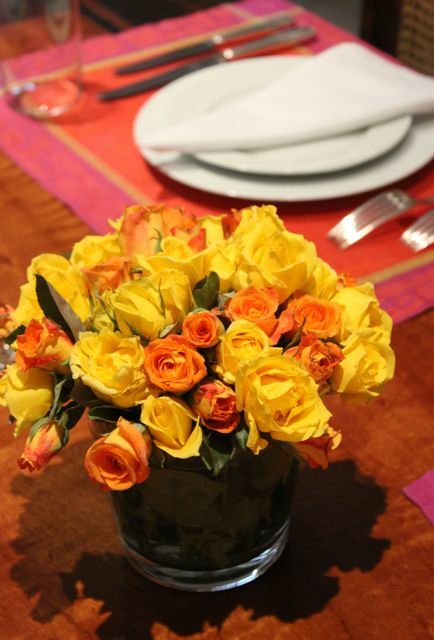 Cut off about an inch from the bottom of the stems and immediately submerge the bunches of roses (remove any paper, etc.) in the cool water. Its okay to even submerge the flowers themselves. 4. Try to use a sharp clean knife rather than a scissors that tends to squeeze and bruise the stems. 5. After about 2-3 hours, you can strip the roses, cut them to length desired and place in your vases, first filled with fresh cool water and some flower food. If you don’t have flower food, use a drop of clorox for say every liter of water. The clorox retards bacteria growth. 6. Change your water daily if possible. 7. Keep in a cool shaded place, out of serious drafts. Thanks so much for the advice MM! Now to impress my wife with these newfound flower display skills! Dogbone, watch out for the thorns… if you really get into it, buy one of these thorn strippers while on a trip to the U.S. or if you have relatives living near whole flower market areas… or on-line I suppose. They really make life a lot less prickly. To keep cut flowers fresh longer and also avoid those watermarks on crystal and glass vases, here’s a tip: a teaspoon or so of bleach added to the water.